Is solar power cheaper than grid electricity? In some countries - YES. But this solar power is heavily subsidized. This subsidy is needed to cover the cost of uncertainties like future inflation rate, future energy-inflation rate and the value of modules at the end of their life cycle. These subsidies makes solar from being "probably economical" to "almost certainly economical." The US federal solar panel subsidies given to solar customers are quite considerable. Solar projects gets back 30% of the installed cost in the form of federal tax credits. In 2011, this sum came out to be nearly $1.6 billion, when claimed by nearly all the solar projects which are for 878 megawatts of solar at an average price of $6.20 per Watt. Apart from this, several U.S. states, offers local and state incentives which makes the solar energy cheaper. Recently solar leasing companies are becoming very popular as they lease solar panels to customers at very competitive rates. So customer can benefit from solar energy without owning the system. These companies take advantage of depreciative incentive which is offered to large 3rd-party solar companies to make profit while still offering the customers a good deal on their solar system. Most governments today are encouraging people to install solar arrays by making their solar energy cost at par with grid, thus attaining the solar parity, i.e. the cost of solar is equivalent or less than the cost of grid electricity. There are many options available through which customer can install solar energy. Customers can either get the solar energy by leasing the solar array from the third party, can install their own solar system or buy solar energy on contract. Mostly, these solar providers will offer the customer a lower price for the electricity than they pay to the utility. In subsidized solar parity, customer might be paying the third party, solar price at par or less than the utility prices. But in actual it is not the case. The actual cost of solar electricity is much higher and is subsidized by the 30% rebate in the form of federal tax credits and tax saving via accelerated depreciation. So the costumer might be paying 7c per kilowatt-hour for solar energy, but the actual cost of generating the electricity from solar array and supplying them is approx. 12c per kWh, difference of which is paid by federal tax payer. So basically, existence of these subsidizes makes the power purchase agreement between the third party and customers "solar parity" and not the actual solar price. In unsubsidized Solar Parity, solar electricity is priced without subsidies and customer can buy solar power for less than the power from their utilities. Places like southern California or New York have already reached at "Unsubsidized Solar Parity" based on their local solar resource, local electricity prices and reduced solar prices across the country. In future federal tax incentives will act as additional motivation for future solar installer. 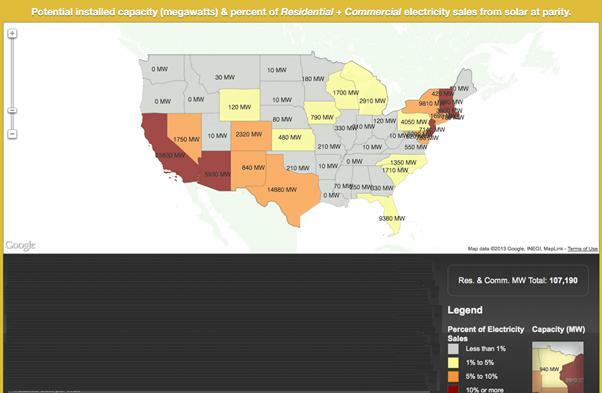 This U.S. map indicates solar power (in megawatts) produced by its states for residential and/or commercial customers , that could produce electricity at or below the utility's retail electricity price (without subsidies).The shaded colours indicate what percentage of the residential and/or commercial electricity sales could be met with the cost-effective solar. Data for the map are derived from the Commercial Rooftop Revolution report released by the Institute for Local Self-Reliance in December 2012. First report is by Lux Research, which in its report "Cheap Natural Gas: Fracturing Dreams of a Solar Future," states that utility scale solar power is poised to become cost competitive with natural gas by 2025. The report evaluated the levelled cost of energy (LCOE) for unsubsidized solar, hybrid solar/gas technologies and natural gas till 2030 under various future natural gas price scenarios and was spread across 10 different parts of the world. The study assumed a delay in shale gas production due to anti fracking policies in Europe, a 39% decrease in utility-scale system costs by 2030 and high capital costs in South America. The report concluded that the levelled cost of energy for unsubsidized utility-scale solar globally will be only about $0.02/kWh above the price of power produced by combined cycle gas turbines by 2025. Ed Cahill, an associate at New York City-based Lux Research and the lead author of the report said "On the macroeconomic level, a "golden age of gas" can be a bridge to a renewable future as gas will replace coal until solar becomes cost competitive without subsidies. On the micro-economic level, solar integrated with natural gas can lower costs and provide stable output." Second report is by the global investment banking giant UBS, which has issued a revolutionary report entitled "The unsubsidised solar revolution" stating that the arrival of socket parity (where the cost of installing solar is cheaper than grid sourced supplies) is about to cause a boom in the un-subsidised solar installation in Europe, which will change the energy market forever. UBS based its calculations on two principals - one is the falling cost of installed solar PV (including inverters and balance of systems costs) which have almost halved in the last few years and second is the rising cost of grid-based electricity (ironically including the cost of renewable subsidies). The UBS energy team writes "In combination, we see this as a game-changer for the competitiveness of solar systems". Private households and commercial users will be able to save on their electricity bills if they install a solar system - without any benefits from subsidies." The report also states that unsubsidised solar systems are now at break-even and estimates, the payback time of unsubsidised solar systems will shrink to some 10 years for residential rooftops and some five years for commercial installations by 2020. It said that every household in Germany, Italy and Spain should have a solar system by the end of the decade. So right now, the solar power is cheaper than grid electricity and is mostly through subsidy. These subsidies are important for solar industry due to various factors such as, natural resistance to change to solar energy and incentives are required to overcome this resistance and until rooftop PV systems become a norm. In the areas where natural resources are not available in abundance and in areas where PV systems are not common, incentives are required by solar installers to make solar energy competitive. In sunniest regions the looming reduction in the federal solar tax credit may not pose as a problem but can be a big hindrance in emerging market. But eventually efforts should be made to phase out the subsidy because ultimately, it is this unsubsidized solar parity that matters. Places like southern California and New York are already at Unsubsidized Solar Parity and Germany is aiming to reach there soon. So we can say that years down the line the only solar parity we will hear will be unsubsidized solar parity.